Saturday May 16th, time for the annual Zone 6 pilgrimage to pay homage at the collections of members from one of our branches. This time it was the turn of the Harrow Branch, an area I knew well from my past life when I lived in the area. Jeff & Diana turned up at Lakes Lane at just gone 10.00 and we transferred to my car for the drive down. We joined the M1 and were instantly concerned that so many others were also heading our way; how could the Harrow members cope with so many? We soon realised that most of the travellers were refugees from Hull escaping all the cactophiles using their home town for embarkation on ferries to the Dutch nurseries. It seems they were engaging in a gathering at Wembley Stadium for a ritual contest for a silver cup. After about 40 minutes of my sedate passage down the M1 and a scenic tour round the outskirts of Watford we arrived at the home of Martin Edwards at Eastcote. Here the ritual welcome of ‘Hello, would you like a tea or coffee?’ was met with the password, ‘yes please, coffee black and strong’. Having passed the test we were allowed into the greenhouse, a new installation of 12ft x 24ft with one end sectioned off for a hotter area. 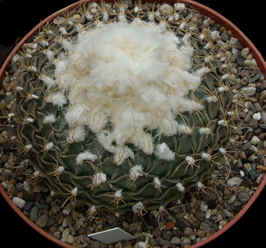 The highlight for me was Martin’s collection of Ariocarpus, Obregonias, Strombocactus and Aztekiums all bursting with health and covered in pale wool in the crown. Some strange plants that need identifying were accompanied by many choice Euphorbias and Pachypodiums all just breaking into growth and flower. This was a great collection that fitted well with my tastes. 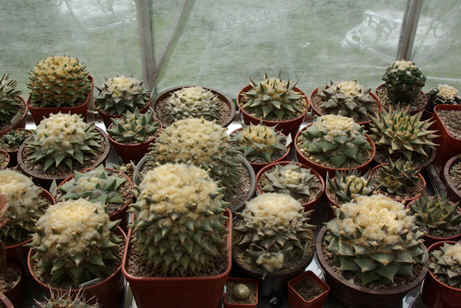 A view in Martin Edwards’ greenhouse with fine Ariocarpus. 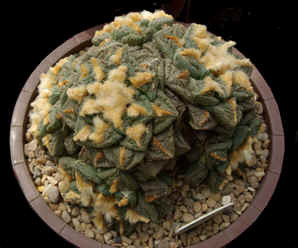 Martin’s Aztekiums and Obregonia. 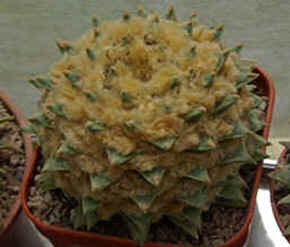 Superb clustering Ariocarpus fissuratus Obregonia denegrii. Again a plant with abundant wool. As the publicity blurb had said the hosts would be taking a lunch break from 1.00 to 2.00 we retired to a local hostelry for a drink and snack before driving across the region to Barnet via Stanmore where hordes of Hull supporters were parking for the rail journey to Wembley. Eventually we came to the site where Derek Tribble houses part of his collection. At this venue he keeps many of his cacti and most of his Tylecodons while the rest of his South African plants are at another place. This collection brings together many plants that require an expert enthusiast such as Derek to understand and grow. Finally leaving Derek’s collection we drove the couple of miles to the home of Elizabeth Pendleton where after the usual coffee and cake we wandered through her immaculate garden filled with fascinating plants to her two greenhouses. One housing a general collection of cacti (other succulents were almost totally non-existent) the other dedicated to her collection of hybrid Echinopsis which unfortunately required another 10 days or so before the small fluffy buds would mature into their cascade of colour. After a very pleasant day travelling round these collections, meeting up with the owners and other visitors we eventually headed back home. Although there were plants for sale I managed to resist all but one as recent purchases in Holland and Germany and at the Cocozza auction had more than replaced any winter losses and my tardis (sorry greenhouse) is bursting at the seams. Our thanks to Harrow branch Martin Edwards, Derek Tribble, Elizabeth Pendleton and their families for their hospitality. 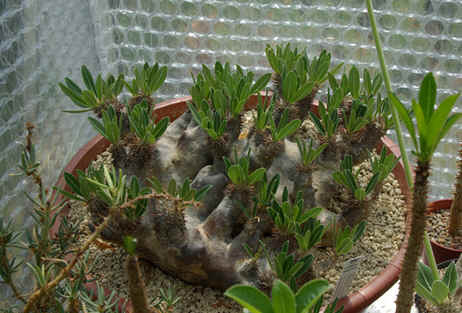 Left: Finally, lurking in the corner, a show quality Pachypodium horombense in Martin’s greenhouse. 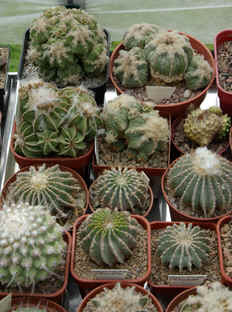 Many readers might know that I like Neoporterias, now known as Eriosyce subgenus #3 Neoporteria according to the NCL. It probably comes as no surprise to some of you that I bought a fine old plant labelled Neoporteria curvispina ‘grandiflora’ at the auction of Jim Lewis’s plants in 2012 to add to my two dozen plus members of that sub-genus. 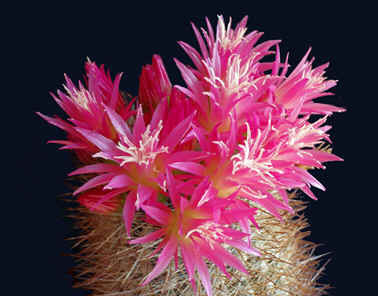 This spring the plant flowered in spectacular fashion. Looking carefully at the spination and flower form it is unlikely to be E. curvispina, more likely to be E. subgibbosa subsp. subgibbosa. But never mind the name on the label, I acquired a well-grown, fine old plant now more than 25cm tall and 10cm in diameter. It is a light brownish-green, like many Neoporterias, with strong spination. I have enjoyed good shows of flowers on my old Eriosyce senilis for more than twenty years, but this year Jim’s plant surpassed even that. It was a fine way to remember an old friend and good servant of our Branch, who served as Secretary and Vice-Chairman for sixteen years. I hope you too have some plants in your collections that are ‘heirlooms’ to remind you of old friends made through our absorbing hobby. Above: Eriosyce subgibbosa in Roland’s collection.